According to Montana law, testators must have testamentary capacity; that is, they must be of sound mind. Testamentary capacity means the acuity to comprehend the amount and nature of the property involved and the significance of executing a will. A testator must also have the ability to recognize his relationship to the individuals receiving bequests of his property. Because minors may not adequately grasp these concepts, Montana requires all testators to be at least 18 years old. In Montana, a will must be in writing. This means a testator can either type or hand-write her will. Handwritten wills are called "holographic" wills and Montana recognizes them, regardless of whether they're witnessed. However, for a holographic will to be valid, it's material portions must be in the testator's own handwriting and signed by the testator. Montana requires two competent witnesses to a will. These witnesses must sign the will within a reasonable time after watching the testator acknowledge or sign the will. In Montana, a testator can make his will self-proving. 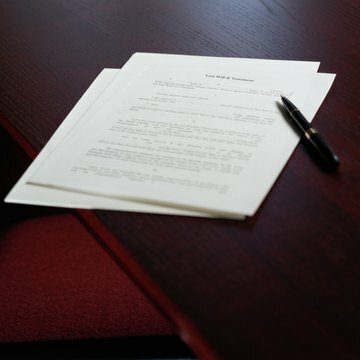 For a will to be self-proving, a notarized affidavit must be executed simultaneously with the will and contain the signatures of both witnesses and the testator. Generally, if a will is not self-proving, one of the witnesses must testify in probate court to verify its authenticity. Thus, making a self-proving will streamlines the process and prevents having to track down witnesses who may have moved to another state. Montana law allows testators to revoke their wills in a number of ways. A testator may revoke his will by physically destroying it; that is, he may tear it up, burn it or cancel it, provided his intent is to revoke it. A testator may also revoke a will by executing a subsequent will that expressly revokes his prior will. Furthermore, a subsequent will that doesn't expressly revoke a prior will, but has provisions that are substantially inconsistent with a prior will, may have the effect of revoking it.